Are you afraid to try sushi because of the thought of raw fish? Worry no more! My family has been rolling our way through Vegetarian Sushi Secrets: 101 Healthy and Delicious Recipes and loving them! No fish, loads of flavour, and there’s something for everyone, including non-sushi recipes to boot. When Tuttle Publishing asked me if we’d be interested in reviewing their newest cookbook, I asked my family if they were interested, and it was a unanimous “Hai!” with enthusiastic nods of the head. Let me tell you a little secret…when I lived in Japan, I didn’t eat sushi. Shameful, I know. But I have a severe allergy to shellfish, as well as some fish, so I thought it was best for me to err on the safe side. So I really didn’t start eating sushi until a few years ago, when I began to make it myself (and of course, I love to try it at the Japan Society events as it’s clearly labelled). 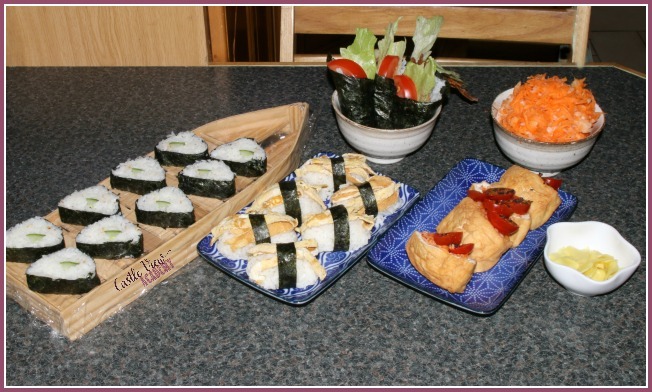 I thought Vegetarian Sushi Secrets would give me new ideas and combinations of flavours to add to our meals. And it didn’t disappoint! I was able to source the majority of the ingredients at the Asia market in Belfast, so I was off to a good start. 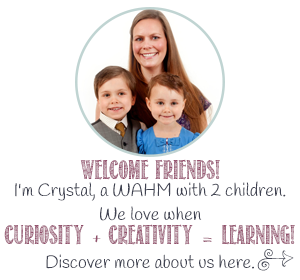 I brought home a couple of things that my family hadn’t seen before, but were eager to try. I was so excited, I finally bought myself a Santoku Kitchen Knife similar to this one. You know I love to put my all into my work, so I set about making a few of the dishes from this cookbook. One of the foods I recall loving in Japan, but haven’t had since was Daikon Slaw. Daikon, is, of course, a huge Japanese radish. Now, I have 2 males in the house that are adamant that they do not like radish – but they’re also the two who most enjoyed this recipe! 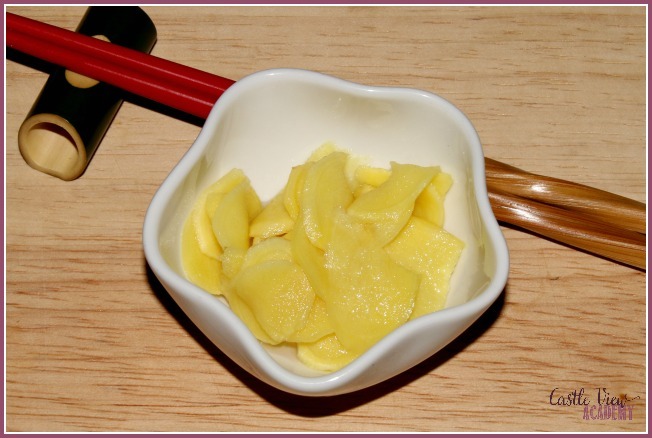 The Pickled Ginger is incredibly easy to make! It doesn’t take too much time, and the longer it sits in the fridge the more mellow it becomes as the flavours even out. Tristan always insists on having some with his sushi and I dare say he likes this homemade version even better than the ‘bought’ variety. Our lovely neighbour gave us some cherry tomatoes and they were just perfect to sit atop the Spicy Carrot and Tomato Inari Sushi. 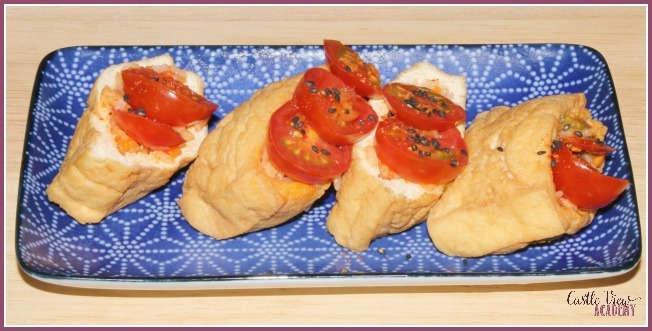 (the inari are seasoned and fried tofu pockets that come ready to stuff once you slit them open on one side; think tofu pita pocket). 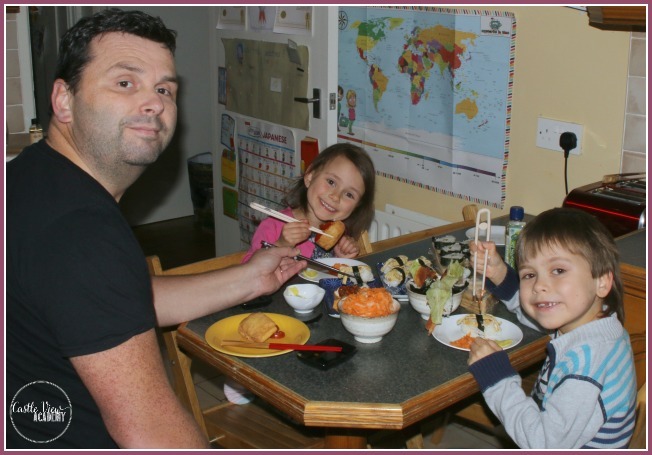 We had more rice than pockets, but Phil didn’t mind at all when he took the left over to work with him the next day 😉 In fact, the flavour of this rice is even better the next day! 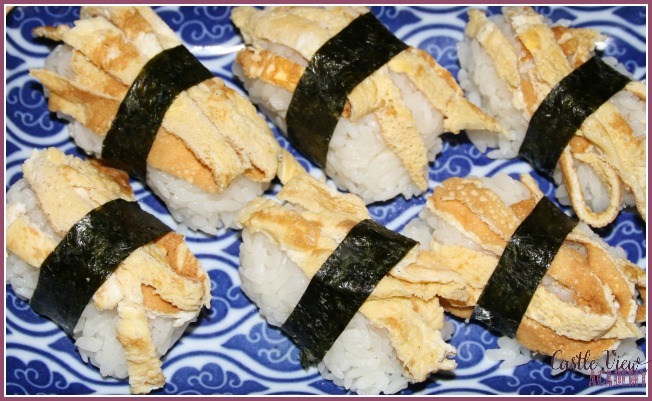 One of the first recipes that caught the attention of my children was the Tamago (egg) Nigri. They love having egg sushi. We have Japanese omelettes so often that I really should think about purchasing a ‘proper’ pan for them, but our usual cast iron one does do the trick. The nigiri took a little practice to do to get the rice not to fall apart while I wrapped and fastened the nori belt around the middle. My egg could have been prettier, but I think these turned out pretty good. Another favourite in our home, are Cucumber rolls (once again, those that profess they don’t like cucumber gobble them up)! These have become even more popular since the kids have read The Last Kappa of Old Japan, where the kappa’s favourite food is cucumber. If you haven’t made sushi before, I’d suggest these as a great place to start as they are the easiest to make! I usually enjoy making sushi with a proper sushi rolling mat but on this day mine had gone off on an adventure so I brought out the sushi making kit my sister sent me a few years ago, and it made lovely triangular rolls. Hand rolls are great for parties, or for a casual family meal. You can place the ingredients out and everyone can roll their own using their choice of ingredients. We made the Vegetarian BLT Rolls, which isn’t something you’d always think of when you think of sushi. Sushi can be made from just about anything; so open your mind to the possibilities! This hand roll would be a nice introduction to those who think they don’t like sushi, or for a fun brunch. I also brewed up a pitcher of Iced Green Tea (with a lemon-ginger syrup for extra flavour and sweetness). 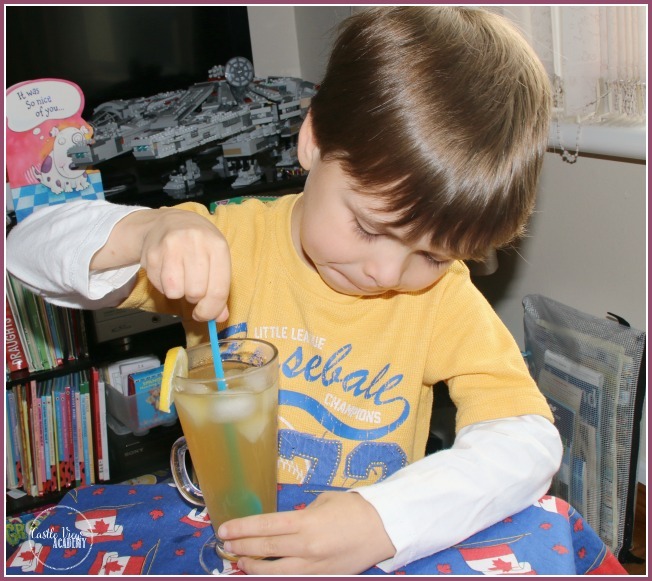 Tristan enjoys green tea, and he finished his glass, as well as that of his little sister! 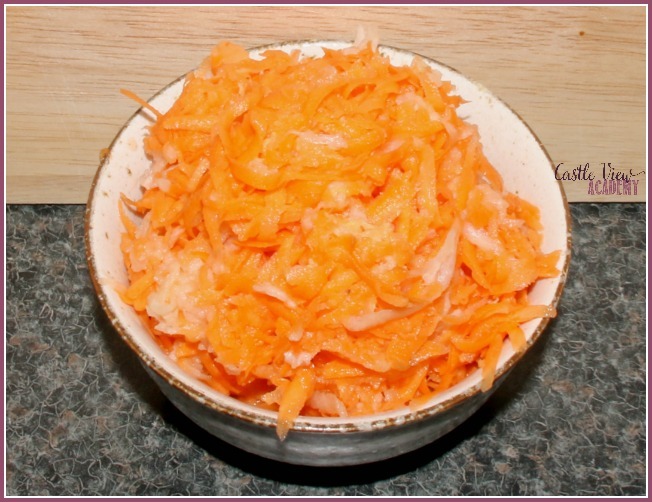 The Sushi Rice Dressing is included so you can make perfectly flavoured sushi, and as they say, make double the recipe and use the leftovers for the Daikon Slaw or Pickled Ginger. There are many more recipes in Vegetarian Sushi Secrets that I’m going to try (Kimchi, Panko Fruit Crisp, Sesame Strawberry Rhubarb Rolls, Pickled Lotus Root, Soy-Glazed Sweet Potatoes, Soba Noodle Soup, and the sauces and condiments I’ll definitely be making fresh in just the right amount instead of buying big bottles. 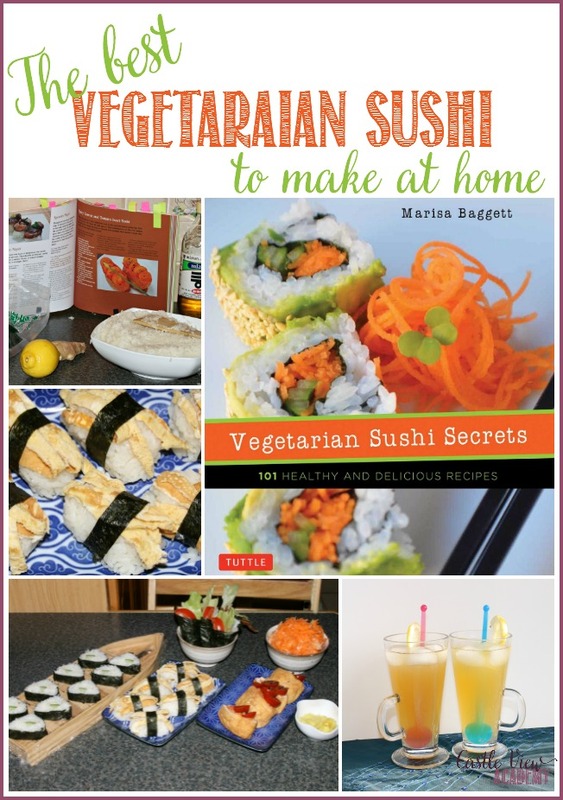 Yes, Vegetarian Sushi Secrets: 101 Healthy and Delicious Recipes is a fabulous resource! In fact, I’m having Phil stop at the Asia Market again this week to pick up a couple of ingredients we’ve run out of so I can continue to work my way through. 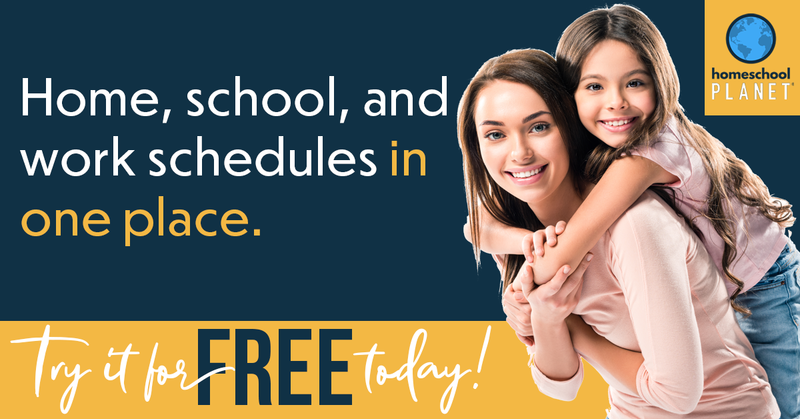 And don’t forget – always make more than you think you’ll need – the family will keep going back for more….and you’ll want to have left-overs to pack up in bento boxes for lunch the next day. I know my family – so I made sure to put some aside for lunch before serving my family. This vegetarian cookbook offers completely new ways for localvores to enjoy their community supported agriculture and market vegetables with sushi rice. This is the ultimate farm-to-table book with creative Asian flair! Marisa not only shows you how to make the usual thick and thin rolls but other types of sushi that are just as delicious and even easier to make! Love the idea of Vegetarian Sushi. I haven’t tried rawfish before either and I won’t, so vegetarian sushi could be an interesting alternative. Besides, I also learned a new Japanese word – “tamago” thanks to your post. Tamago is kind of a fun word! And in fact when I was living in Japan I once came across a ‘Tamago Bank’ That was the actual name of it! Vegetarian sushi is a great place to start…and then if you’re adventurous, add in a little meat or (cooked) fish and find the flavour combinations you like in the sushi style that appeals to you (the hand-roll is super-easy and great for parties – think ‘sushi banquet’/ ‘Sushi bar’! Japan is such an amazing country with many surprises!